Henry R. "Bob" Price, son of Katherine B. Price, a vocal teacher, was born in Portland, Oregon, and signed as an outfielder with the San Francisco Seals in 1938. The Seals farmed him out to the Tucson Cowboys of the Class D Arizona-Texas League and he impressed manager Harry Krause with his speed and hitting during spring training at Hansford, California. Price enjoyed an excellent rookie season with the Cowboys, batting .291 with 74 RBIs in 130 games, and advanced to the Salt Lake City Bees of the Class C Pioneer League for 1939. Organized Baseball had been absent from Salt Lake City for 11 years, and when the team took the field at Community Park for their first spring training session on April 18, more than 200 fans were in the stands. Price, playing left field and batting in the number three spot, hit .346 with 38 doubles and stole 27 bases. It was a great season for the 20-year-old and he fully expected to be joining the Seals in 1940, but in late September, Price suffered a ruptured appendix that required emergency surgery and numerous blood transfusions. He spent several weeks at the Mount Zion Hospital in San Francisco, and the incident drastically affected his baseball career. At spring training with the San Francisco Seals in 1940, Price was a contender for Dom DiMaggio's vacated center field berth, but the after-effects of hospitalization hampered his performance. He did manage to earn a place with the team when the regular season began and remained until late June, but appeared in only 14 games, primarily as a pinch-hitter and defensive replacement. Price was then optioned to the Ogden Reds back in the Pioneer League, where he failed to hit and was sold to the Boise Pilots of the same league on July 18. Price appeared in 72 games for the season and his batting average dropped 135 points from .346 in 1939 to .211 in 1940. Price began the 1941 campaign with Boise, and although there were occasional highlights such as three hits against Twin Falls on May 4, he was batting just .231 when Boise owner Haydn Walker sold him to the Oklahoma City Indians of the Texas League. The Indians immediately optioned Price to the Salina Millers of the Class C Western Association, where he continued to struggle at the plate, and he finished the season with the Clarksdale Tigers of the Class C Cotton States League, where he batted an improved .263 in 55 games. Price was in military service the following year and served with the Navy in the Pacific as an aviation machinist's mate first class. Bob Price was lost at sea on December 31, 1944, and was survived by his father, Abraham, who was living in San Francisco, his mother, Katherine, and two brothers, Edward and Stanley, who were in Portland, Oregon. 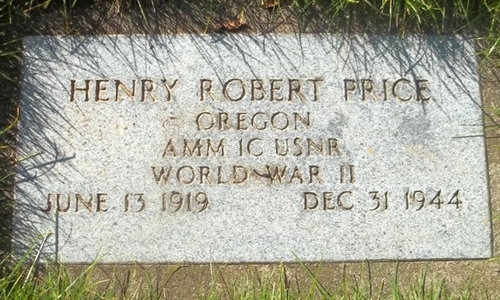 Bob Price has a marker at the River View Cemetery in Portland, Oregon.